Setup cones about 5 yards apart in a zig-zag pattern. The length of the zig-zag pattern should stretch approximately 20 yards in length. Players line up at the last with a ball each. The first player in line dribbles around the outside of the cones in a zig-zag pattern. 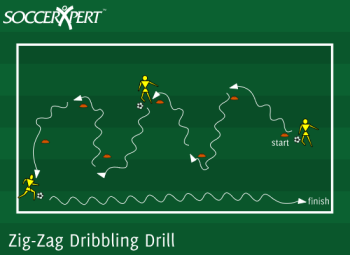 When the dribbling player reaches the end, they must sprint the distance of the zig-zag course and return to the line. Let the players go through the course a few times to get comfortable with their touch. Now as the players are moving to their right side, they must dribble normal. However, as the players move to the left side they must roll the ball with the soul of the right foot. Change the pattern to move normally when moving to the left, but roll the ball with the soul of their left foot as they move to the right. Controlled touches near the dribbling player. Moving the ball through the pattern with the soul of the foot only.